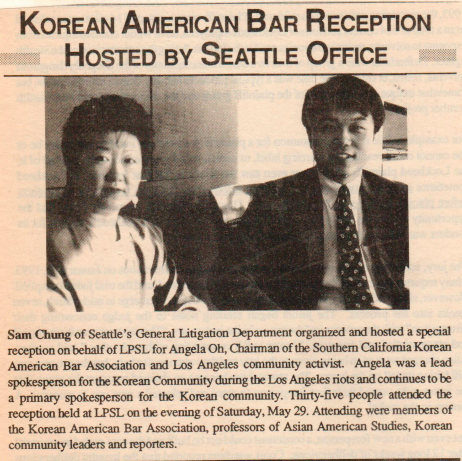 In 1991, Judge Samuel Chung had an idea to start a Korean bar association to serve the local Korean community. He reached out to Korean attorneys in the area by contacting names listed in the Washington bar directory. For the first two years, about 5-6 attorneys met informally. 1992: KABA’s first legal clinic opens in June 1992. 1993: Judge Samuel Chung becomes the first KABA President. 1996: KABA hosts the International Association of Korean Attorneys (IAKL) for the first time. 2000: Michelle Chen becomes KABA's first female president and the first to serve 2 terms as president (again in 2011). During 2000 – 2011, KABA's membership and support from the greater community grew significantly. As a result, KABA expanded its services and role as a resource in the legal community. Importantly, KABA established a strong relationship with local law schools in order to connect with law students and provide opportunities to advance in the legal field through unofficial mentoring and a scholarship program. 2001: KABA opens its second legal clinic; hosts the Korean Consulate General for the first time at KABA’s annual banquet. 2002: KABA experiences significant growth in membership and support from the legal community. 2003: KABA launches its first website. 2004: KABA begins the Joint Asian Judicial Evaluation Committee (JAJEC), scholarship program for law students, and connects with the Washington State Bar Association (WSBA). In response to a shaken economy recovering from the recession, KABA provided support to its members through networking events, including joint events with MBAs and Korean professional organizations, job opportunities and mentorship. KABA established its official mentorship program, connecting law students with practicing attorneys in order to provide additional guidance and support for those entering the legal field. KABA maintained its goal as an organization to give back to the community by continuing to run its pro bono clinics and offering workshops and legal seminars for the local Korean community. KABA continues to expand its community activism both nationally and globally, and continues to grow each year.